In general Leetness can be said to be “the potential to cause Kewl (not to be confused with cool) things”. Th3 m0$t <0mm0n d3f3n!t!0n 0f l33tn3$$ !$ th3 am0unt 0f K3wl that a p3r$0n 0r th!ng <an d0, a1th0u8h !t c0m3$ !n a var!3ty 0f f0rm$, l33tn3ss 0f a11 type$ (haxx0r, ninja, pirates etc) can be put in one of three broad categories: computers, pwnage and the “Fundamental Elements”. By this definition, potential for Kewl and leetness have the same units called the Leet. The leet is an SI unit and is the amount of Kewl generated by boiling a liter of water. The amount of leetness in any system is closed, that is to say Leetness is conserved, to take the case of boiling a liter of water, a leet is taken from the water and transfers it to the person. 45 n0t3d 41l f0rm5 0f 1337n355 c4n b3 c4tegorized as belonging to one of three forms: Computers, Pwnage and the Fundamental Elements. Video game leetness is sometimes is infered as ex: "b00m H3dshot!!!!!! 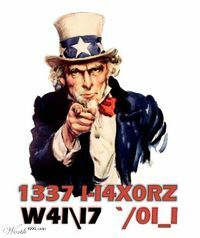 !1111!11onetwo"
Computers are one of the most common forms of leetness, for example haxXess of a computer may generated upwards of 4 kiloleets and this increases exponentially the more secure the system. For example a haxx0r who enters military computers could gain leetness in the teraleet range. Leetness is also gained by having a powerful, or unusual computer. A top-of-the-line b0x can be worth 500-600 leets. The best way to get leets would be to get cyberlaid, the leets earned by getting cyberlaid vary between 600-700 leets, depending on the virtual pleasness the partner is receiving, if you can't cyberbang liek pr0s you will loose leets most likely, if you can h4x you can easily receive leets like that, for e.g one spam mail sent with a bunch of "so i herd u liek mudk1pz" may be worth 20 leets, but a full on pr0nz virus earns at minimum 500 leets, racism is also a huge leet earner, e.g harr0 i r e4tz soosh1 wif ur mom. Personally, I just earn my leets through pr0nz surfing happy time for me and for leets. Another source of leetness is through Pwnage, by defeating or 0wning an opponent, this includes causing an opponent to ph33r you or from mad tekniq. other forms of of 1337|\|355 are found it players who can nag tag someone from half a map away from there foe or failing to do that snipe whit the thumb reflexes of a god/(_)83|21337 player, if you have ever found your self doing on of these things you could score up to 5 to 10(max) of leets, if you are capable of these you fail because you must do these things "OVER 9000" times in a 3hour sitting of a game that you are able to nag tag and/of snipe in if you fail you qualify for the subtitle of semileet game player. The fundamental elements are concepts, things and people of pure leetness. Merely being associated with one of these fundamental elements results in huge transfer of leetness. The fundamental elements include people like ninjas and pirates or concepts like ...of Doom, mega, pr0n and Jebus. Which can easily transfure leetness in the kilo if not megaleet range. some people (5%) suffer from delusions of 1337|\|355 these people have been known to use aimbots and map hacks to such extent that they believe they them selves are 1337, the map hacks become like a drug for them and they then cannot stop, while if you get to someone before they become dependent off map hacks/aimbot they can become some of the 1337357 player's ever. other people(5%) suffer from luck shot syndrome and come to suffer because they think they can shoot you just using their toes on the controller/keyboard and mouse. on many occasions these people have to be totally pwn'd for their own good, this is to get them back into the right mindset, once you have achieved this they are on the road to recovery. while most people(90%) are just |\|0085(and don't know it), and the leading cause of |\|0085 are |\|0085, its like a virus once you have been |\|0083|) you are then a newbie if you keep on the road of playing with |\|0085 you will slowly evolve into a troll. This page was last edited on 2 March 2012, at 19:20.